the toughest part of that race was the first half hour when I began to wonder how I would even last for the next hour as the sun was beating down on usTwo brave friends of mine, Nancy and Amanda, has just attended an international outrigger race in Saipan. 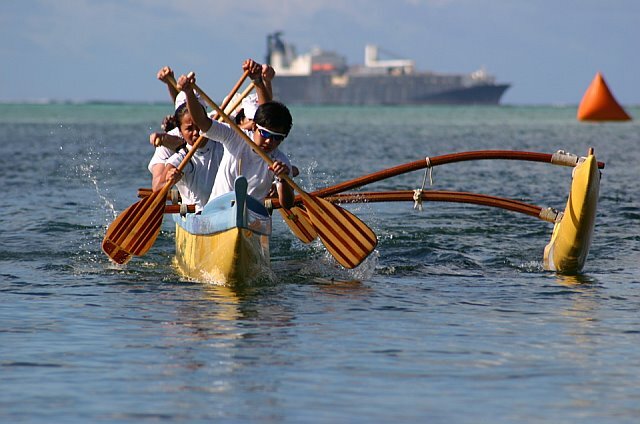 If you don't know what is an Outrigger, it is a traditional canoe used by Micronesia people, you paddle it in similar technique to Dragonboat, except you switch the side that you are paddling every 18 strokes. It has a supporting buoy (the outrigger), thus more stable than a dragon boat and therefore capable ocean crossing and riding bigger waves (Nancy please fill me in). 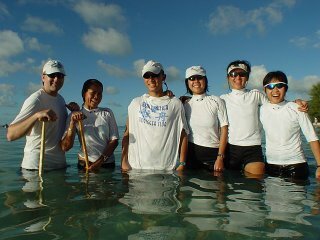 It was the 8th Micronesia Cup in Saipan, Nancy and Amanda represented the South China Sea Outrigger's mixed team competitng with giant paddling team from different island communities, including teams Saipan, Guam, Japan, Palau and Hong Kong (the mighty HK Island Paddler Club was also there). They did three races in two days, 500m, 1500m sprint and grueling 12miles distance challenge! They did brilliantly well but I will let Nancy to do the talking. "I'm in Seat 3, who does the calls for switching sides on which you paddle. This means you have to be able to paddle and count to 14 at the same time (tougher than you might think! ), while being careful not to call a switch when big waves might knock the ama (stabiliser) up and potentially huli (capsize) the canoe...."
In the end they came third in the Mixed Team catogroies, it was her first international race and it was such a tremendous achievement. I am inspired, maybe in the next dragon boat season I will paddle again and give the best of my effort, maybe even train with these stars for a long distance race. Afterall I always have an appetite to take on something BIG. If anyone of you are equally inspired, their club is always looking for more new blood. Finally I've got my future settled this week, I am moving on to a new job in mid November and will finished with my current company after this month. That gave Martina and I about a week to go on holiday before rushing back to do the Trailwalker. We've chosen to go to Japan this time, I've not been to Japan despite my adventures all over the world. I have been a third world countries travel specialist for all these years and Japan just doesn't quite fit into my profile. But with only a week to spare, it was a rush to some of my projects in store. Though it has been an amazing discovery to find out what adventure can be done in Japan. I have learn that there is a strip of mountain called the Japan Alps in the mid north of country in the Nagano Perfecturewhere there are some beautiful alpine scenery. There is a 6 days traverse across the alpine ridges and finsihed in a moutian resort town called Kamikochi. The beauty is you don't have to carry too much as you can stayed in moutain huts at above 2000m high, with food and bedding served to you. Though unfortunately as I though I have found the highlight of the year, the local hostel, Nishiitoya Mountain Lodge, told me it was a too late the time of the year to get some reasonable hike, snow is due by November. May be something for the next Freeyasoul Adventure. Now I am planning to do something less ambitious and explore the Odaigahara plateau in the Mie Perfecture near Osaka and Kyoto. This time I am hoping to do a 2 days route from Osugidani to Odaigahara, it would be up a gorge with steel chains bolted on the cliff side for us to pull on, 8 waterfalls and river crossing by traditional boats along the path. Though a local hiker from IOC Kansai has informed me that due to a typhoo 2 years ago, the route was still a closed. So right now, I am a bit stuck, but reading throught the walking guide of Japan by Lonely Planet, there are tones of day hike around the Kyoto region. .... sometime you have maintain a fine balance between hope and despair". Such a terrible way to live that you can't give yourself too much hope nor despair to overcome the endless misfortunates in life. It is kind of a belated post. The Man Booker Prize of 2006 was announced a couple of weeks ago. The Man Booker Prize is an annual award given to comtemporary English fiction. I am rarely disappointed when I select my reading materials from the list of past winners or even the shortlisted novels. It was a delighted to know that this year's Booker goes to another India novelist, Kiran Desai and her book "The Inhertitance of Loss". I have gone out to buy it the next day when I heard about the news. Why do I have so much faith Indian writers? The two previous Bookers I read by Indian novelist were among some of the best novels I have read, they were "Midnight's Children" by Salman Rushdie and "The God of Small Things" by Arundhati Roy. Together with "A Fine Balance" by Rohinton Misty were novels that have profoundly touched me. There are certain common elements that runs through those three novels, characters from marginal communities, living in turbulent times, caste systems, despairs and unfulfilled dream, weaved through a poetic style of writing and sometimes offers me a glimpse of philosophy of indian way of life. The line that I remember most well from "A Fine Balance" is ".... sometime you have maintain a fine balance between hope and despair". Such a terrible way to live that you can't give yourself too much hope nor despair to overcome the endless misfortunates in life. Well going back to "Inheritance of Loss", I have just started reading it, so in due course I can give you a full report about it. But at the moment, I will just share with you the opening lines of New York Times review, "ALTHOUGH it focuses on the fate of a few powerless individuals, Kiran Desai's extraordinary new novel manages to explore, with intimacy and insight, just about every contemporary international issue: globalization, multiculturalism, economic inequality, fundamentalism and terrorist violence. Despite being set in the mid-1980's, it seems the best kind of post-9/11 novel." If like the review said, the novel touches on the global issues of today yet, connect them with the everyday characters with the skills of all the other Bookers winner, I am sure it will be a lovely ride to read on. Press "F5" on your keyboard and a different banner should appear. After two days of trying (yep very sad, but do I care! ), I have finally modified my blogger template to do random roation on the banner graphics. If you don't get what I mean, press "F5" on your keyboard and a different banner should appear, if it happen to be the same banner then press again till you see a new one. It is a standard plug-in for Wordpress but we didn't have it in Blogger.... until now. Well I think this could be the first in the world of Blogger Beta, if not it is definitely my first hack anyway. Thanks Ramani from Hackosphere who gave me a few tips. Read on to see the scripts I have used. I am not sure if it will works for all blogger templates, so I will just show you what I have done and you may have to modified it for your template. First of all I assume you have created a few graphical banners and have uploaded them onto a graphic hosting website. My scripts above used Java Script to define an array of 5 url locations of the banners' graphic. Then the next line generate a random discret number between 0-4. The next part will generate some html codes to overwrite the "background" definition of the the "Header" style by selection a random banner everytime. 1) The URL Locations of your graphics. 2) If you have 5 banners, you type "4" in the random number generating equation Math.round(4*Math.random()); If you have 3 banners type "2" and so forth. Good luck, let me know if it works. It has been a testimony to the power of Microfinance in solving the world's poverty problem. Muhammad Yunus and Grameen Bank which he founded, one of the World's most successful Microfinance Institiution in Bangladesh, was awareded the 2006 Nobel Peace Price. Yunus has not only made an impact to Bangladesh but for the last 30 Years, he has export his successful model of Microfinance to the world and has actively drive this global movement. He is a hero to anyone who is aspired to contribute something positive to the world. Read on for an extract from Grameen Foundation on his sucess. "The world is in a barely acknowledged global poverty crisis, one that is at the root of many other crises that grab the headlines every day. More than one billion people are condemned to live on less than US$1 per day. Such a crisis demands tangible, scalable solutions, put into practice on a wide scale. It requires leadership from civil society, and governments. Microfinance is one of the most powerful solutions to poverty in existence today, and Dr. Yunus is the leader most responsible for developing and implementing it in Bangladesh and globally. For thirty years he has been refining the microfinance approach, working incredibly hard every day despite many obstacles. The Grameen Bank that he established now reaches 6.2 million families in Bangladesh alone, and he has established more than twenty other companies, non-profit and for-profit, that attack different dimensions of the poverty problem in a businesslike manner. His story is well told in his memoir, Banker to the Poor, and I recommend it to anyone who wants to learn about how this incredible individual started a worldwide movement. Dr. Yunus, who was a founding Board member of Grameen Foundation, an organization that I have led since it began in 1997, has the intelligence and entrepreneurial talent to have been a multi-millionaire if he had chosen that course. Instead, he focused on creating millions of “multi-hundredaires” by developing an approach to empowering the poor through loans and other financial services." extract from Grameen Foundation. “Gun, Tanks and Steel” Michael Madness the organizer of the Action Asia Challenges told us that was what we have signed up for. 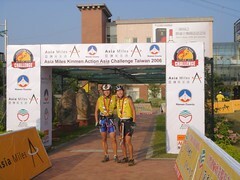 So team “Tempo Sparks” descend onto Kinmen Island of Taiwan for our second adventure race in 2006. 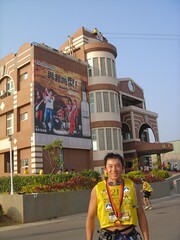 It was 8:30am on 1st Oct, I have been up since 5am to condition myself for the days ahead; we have scouted the first session of the race route as soon as we disembarked the Ferry onto Little Kinmen; and we have forced ourselves all the way up to the starting line ribbon. Gripping the ribbon tightly and breathing in the dense air, every muscle was so prepared. ... his secret weapon, a banana hidden under his forearm gaiter, which has been accidentally squashed anyhow Then out of no where came the Hawaiian beach music played to us by the Kinmen County Government!! Relax, aren't we getting too serious with these races, the Taiwan Action Asia was destined to be a bit of a chill out affairs. Franz the strange South African from team “Ancient Mariner” was revealing to me his secret weapon, a banana hidden under his forearm gaiter, which has been accidentally squashed anyhow (another of his home brew gadget is the duck tape gaiters at his ankles to seal off the mud and sand). A group of Singaporeans behind us were dancing to the tasty music. We know we were up for some sweat may be but lots of laughs. The fact that we were racing on a former battlefield wasn’t intimidating at all, rather the labyrinth of underground tunnels and waterside caves added lots of fun the thrill to the race. Once the whistle was blown, we ran up to small hilly cliff top and descend onto a pier on the other side, and then we leaped into the air and dropped 7 or 8m to the sea and swam into a military tunnel. Crawling through knee high water in the dark, we hit a steel leader at the end of the cave and found ourselves back to where we started, like in a James Bond movie! Back on our Bond mobil, our bikes, we had to circum-navigate the island. The cycling path was a nice and wide paved road around the island, but we were sandwiched between live mine fields on either side. We were told not to corner in extreme speed, in case we launched ourselves through the bared wire and onto one of the Communist – Nationalist Civil War era explosives. Next we had to kayak across the strait to Big Kinmen, Michael said it had taken him anytime from 45mins to 2 hours in the last few trial, but with the current working against us, we shoudl expect the upper end. In the end it has taken us 1hr15mins to paddle across but we have overtaken 10 teams, helped one cap-sided team to get back onto their kayak, allowed 3 teams to re-overtake us again and witnessed those pathetic dumpsters that we helped out to go capped sided again. Running through towns and villages in extreme heat, Andy chose to distract himself by practicing his broken Mandarin on the University Students who volunteered as human road signs. The running was occasionally interrupted by more tunnels, longer swimming, and horizontal abseils across the university, abseiling into more military caves and so forth. At one point we lost the road marks while walking through the bush and were shitting ourselves for stepping on some landmines, we found the way out safely and dashed across a wasted field in the university campus then every officials around shouted on top of their voice, ‘Wrong Way, Get Out.’ I wonder if I was close to losing a limp or two. We were constantly exchanging our positions with two teams which we decided to call them our arch-rivals. “SART Pinnacle” a Singaporean ladies team who re-overtook us while we were rescuing the capped sided team on the kayak, and “FAH-Q” two massive American body builders whose evil deed being jumping the queue in front of me for the horizontal abseil. We out-swam both teams at one instant and had them hot on our heals, but “SART Pinnacle” finally out-biked us again. one of the G. I. Joes sandwiching between me and Andy at times on the final bike sprint, only to have Andy pushing through his limit to fight him off. When closing in on finishing line, one of the tasks in the shooting range was to throw some heavy steel grenades into the window of a brick house 20-30m away. Embarrassingly we had a dozen throws each, Andy was so dehydrated that his throws was barely hitting the wall and mines were chipping everywhere but the target, then to our despair the G.I. Joes (team FAH-Q) was closing in, they breezed through air rifle part like a piece of cake. Fortunately at this point I pulled off the sweetest throw and hit the goal, save me from watching the bigger G. I. Joe doing a hole in one. It was a tense finish for us, with one of the G. I. Joes sandwiching between me and Andy at times on the final bike sprint, only to have Andy pushing through his limit to fight him off. 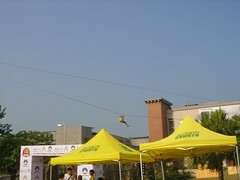 Finally we arrived at the Kinmen Liquor Factory for the glory laps of abseil and flying fox finish. Result :31 out of 56 teams, 7hr44mins. We have definitely became more exprienced and more able to enjoy ourselves in these torturing events. Man it is something I want to do for a long time, to catagorise my posting and create a tag cloud, but Blogger didn't have such function until Beta.Blogger was launched. Then I found this excellent site that taught me how to build a tag cloud for my blog. Now please check out the tag cloud (or Label Cloud) on the side bar. Book Review: Ever since my trip to India and volunteer for Dakshinayan I never stop feeling that there is a destiny in my life that I need to go out and find. Sure it is not just me, everyone has a dream but not everyone dares to chase it. Though I am surrounded by brave people who dares to take on their dreams. My girlfriend Martina has decided to set up her own fashion label. Ahdont has decided to take up pilot as his career. The joy he experienced through the school kids who endorsed the books as great treasure lead him to think what is more important to him in this life.The story of this book is about another brave person who takes on his dream and happily found his role in this universe. John Woods was a high flying executive of Microsoft in 1998, over his trekking holiday in Nepal, he met a government education officer who gave him a tour to a local school along the Annapurna Circuit. After seeing the school's lack of resources, especially the lack of books, he made a promised to the headmaster to come back one day to deliver some books to the children. The next trekking season, he came back to Nepal to fulfilled his promise with few hundered books, it was a decision that changed his life. The joy he experienced through the school kids who endorsed the books as great treasure lead him to think what is more important to him in this life. Swiftly but also painfully he left his successful career, comfortable life as an expat in Beijing, his girlfriend and devote his energy to make this book delivery to third world school thing as big as possible. He ended up establishing Room to Read a non-profit organisation which now build schools, library, providing books and scholarship to children in developing countries. Though in this book, you are not gonna find too many stories of touchy moments of setting up libaries in a third world countries but about a entreprenur exerting his energy and management skill to build a "Microsoft of Non Profit". Right from the start he decided to think bold and vowed to bring education to multiple countires, though he hasn't got a clue how this will be done, but his heart and passion earned him the support of a venture capitalist as one of the first donors. In latter stage he ran his organisation with a "result focus" culture, always chasing numbers, how many new libary built, how many girls on scholarship etc. This impressed many in the business communities who like to see their donation turning into tangible result. We also we re-lived two turing points in the last decade, 911 and Tsunami, how they have ceased the opportunities to expand their organisation during those turbulence time. Though behind all this aggressiveness of a typical American businessman, John Woods still has a great heart and his desire to bring universal education to the world is much admired. And I am so happy for him to hear him said in the ending pages "Having discover my true life path, I am more ready than ever to embrace it. I feel lucky to know who I am, what I want to focus on, and the yardstick by which I will measure myself." Friends if you have a dream out there somewhere, Chase It, Embrace It. Just got back from Kinmen Island of Taiwan for my third adventure race this year, so far so good for my year of adventure race. The race was 60km long, with half of it being biking, 1/3 running around, a bit of swimming and an hour of ocean crossing kayaking. The island is actually quite flat but the race course still has got some unique charaters in the form of military tunnels. We had to labour our way through underground maze, swimming into a waterfilled tunnels for army ships, jumping off 10m high piers. And finally a flying fox finish (below) from the top of liquor factory. A little bit tired right now, so hope to find some time this week.